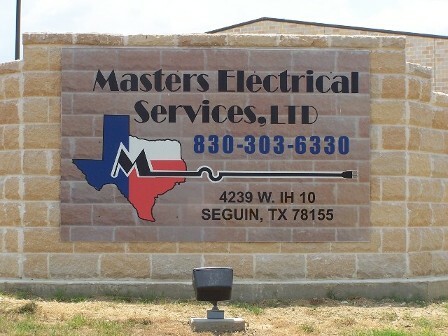 Visit Masters Electrical Services, LTD., a trusted electrical contractor in Seguin, Texas. Heading east bound from San Antonio take exit 601 and proceed to stop sign. At stop sign continue east bound on access road for 2 miles and our facility is on your right. Our sign is at the bottom of the hill. Heading west bound from Houston exit 601 and turn left under overpass and then turn left again on east bound access road. Continue on access road eastbound 2 miles our facility is on your right. Our sign is at the bottom of the hill.